Adaptation to changing weather and economic conditions is fundamental to farm and ranch survival but this year's drought is pushing variable adaptation strategies to their limit. The international community is closely watching how this dire situation is progressing in California and on June 19th the Canadian Broadcast Company (CBC) visited the Sierra Foothill Research & Extension Center (SFREC) to document how ranchers are adapting to these extreme events and the implications these events have on agriculture and ultimately food production worldwide. Filming involved capturing interviews of three ranchers to explore their perspectives as well as a tour of SFREC to examine potential adaptation strategies to drought. 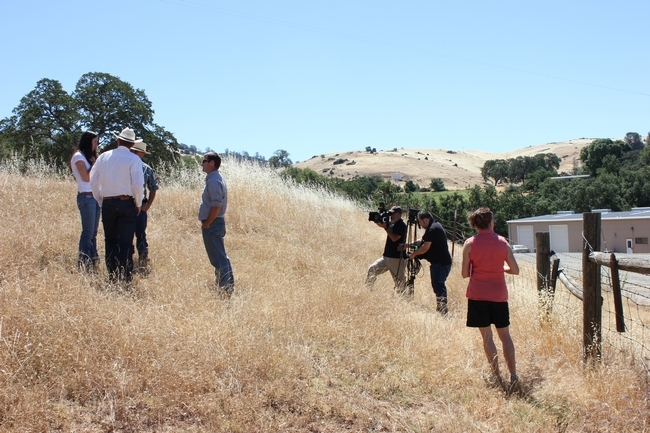 SFREC Director Jeremy James and Livestock and Natural resource Advisor Glenn Nader used SFERC as an opportunity to demonstrate how intensive grazing management, agricultural by-products and culling strategies could be deployed to mitigate some of the impacts of drought. Many producers with limited feed sources are utilizing agricultural by-products that are available in their area in order to sustain the nutritional requirements of their livestock. Nader, pointed out that almond hulls are high in energy and have limited protein, which allows cows to more efficiently digest hay and can limit the quantity of hay they need to consume. 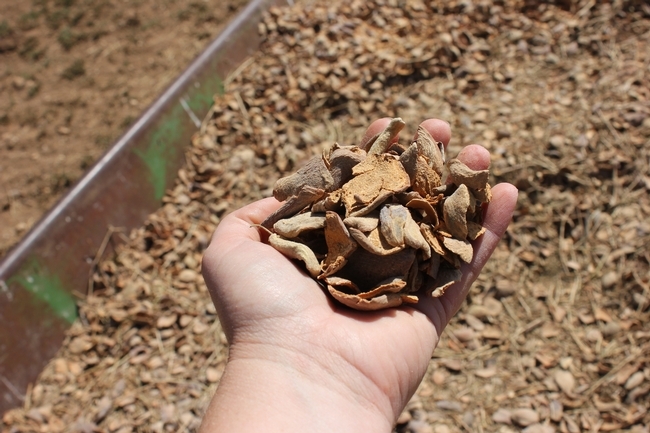 Nader warned that the almond hulls fed must contain a low level of almond shell, in order to avoid problems with rumen digestibility. Rice straw and rice bran are more local agricultural by-products that, under the right conditions, have been utilized as dietary supplements for cattle. 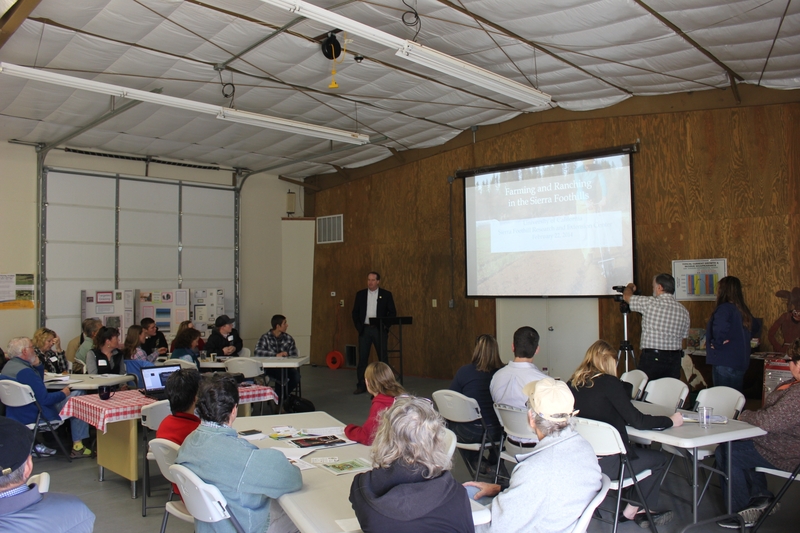 To view the proceedings from the January 29th SFREC Drought Workshop, click here. Producers from the Food and Farm Show filmed and interviewed multiple speakers at the Future of Farming and Ranching Forum at the Sierra Foothill Research and Extension Center on February 22nd. The Food and Farm Show highlights local agricultural events, news, and issues. They are part of Touchdown Productions, which films other regional activities like the “Game of the Week” on the local news channels. 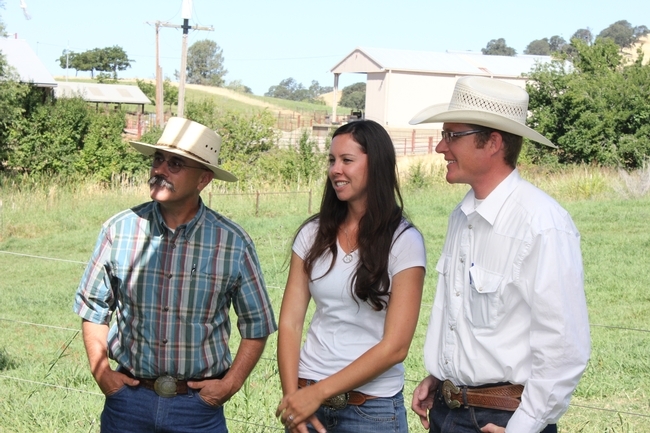 Three episodes were released featuring the Future of Farming Ranching event at SFREC. Important speakers interviewed include Jamie Johansson, farmer and 2nd Vice President of the California Farm Bureau; Susan Hoek, 5th generation rancher in Penn Valley; and Roger Ingram, UCCE Farm Advisor for Placer and Nevada Counties. With media attention like this, SFREC is becoming more visible throughout the region. Collectively, the educational events occurring at all of the Research and Extension Centers help enforce the tangible impacts of UCANR within communities statewide. The Food and Farm Farm can be seen filming the event on Feb. 22nd.